I spend a lot of time in my kitchen cooking, baking and creating food. Having the right tools in the kitchen is imperative especially when it comes to knives and utensils. Food preparation before cooking is the most important part of any recipe and having the right type of knives makes the preparation smooth and easy. All my kitchen knives over the years have become blunt and failed to perform well so when I was sent a set of kitchen knives from Kuhn Rikon I was over the moon. Chefs knife-perfect for slicing meat, vegetables, fruit and cheese. Sandwich knife- this knife has two sides the smooth side for spreading and the serrated side for cutting and slicing. 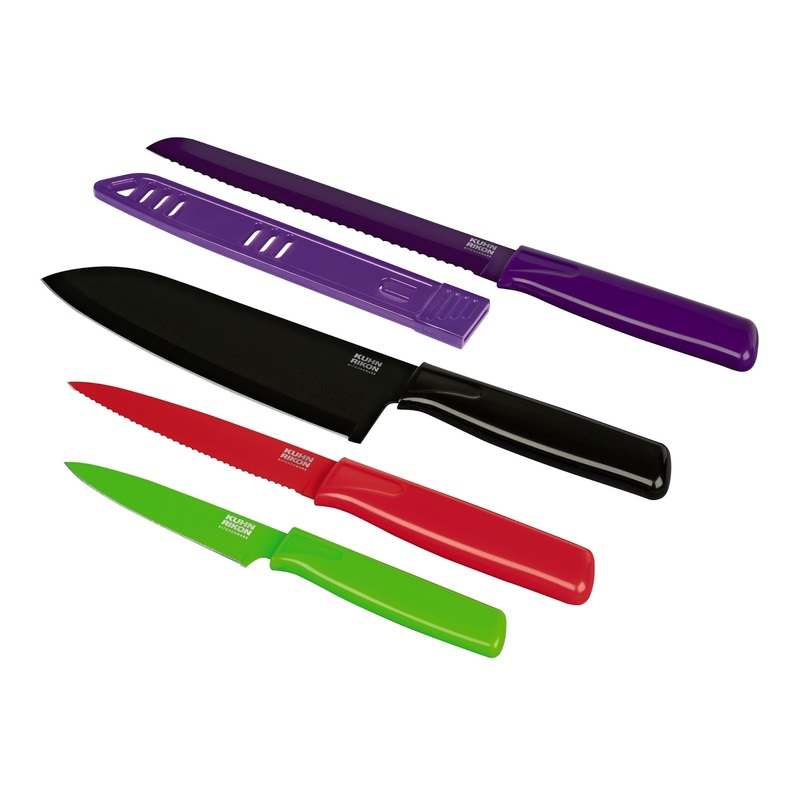 The knives come in 5 vibrant colours; fuchsia, green, red, black and purple together with a matching safety sheath for safe storage and transportation and protecting the blade from getting damaged when the knife is not in use. All the knives are guaranteed for two years and are dishwasher safe. The knives can be purchased in a set of four or separately. You can buy them on line or from many supermarkets and homeware stores. Prices start from as little as £ 4.50. 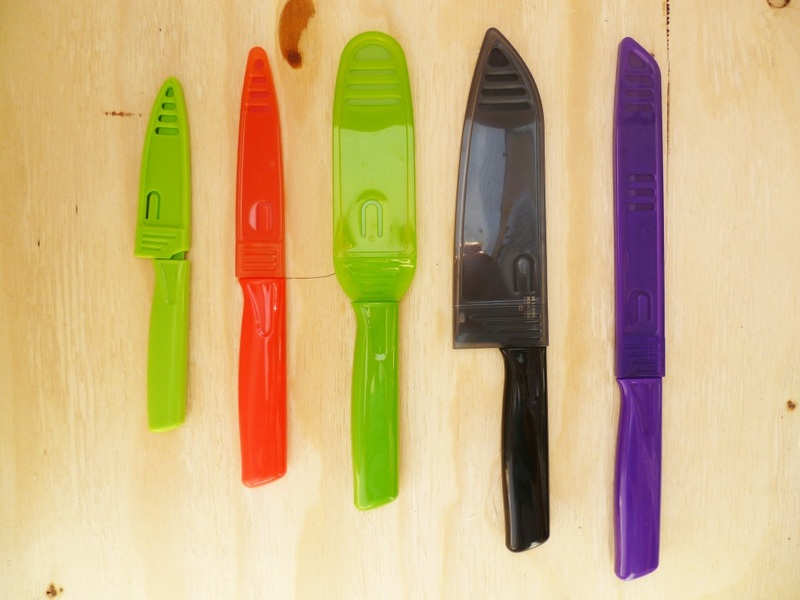 I would like to thank Kuhn Rikon for sending me the set of lovely colourful knives. They have become a favourite part of my kitchen ware. I can now glide through my tomatoes and slice them perfectly; my fresh bread is now beautifully sliced and does not end in a crumpled mess on my bread board. I am able to julienne my veg to perfection due to the sharp paring knife and chopping vegetables for stir fries has become a joy with my chefs knife. Of course I can’t forget the sandwich prep, now my sandwich knife spreads and cuts all in one and it’s so useful. All the views and opinions given in this post are my own and unbiased. 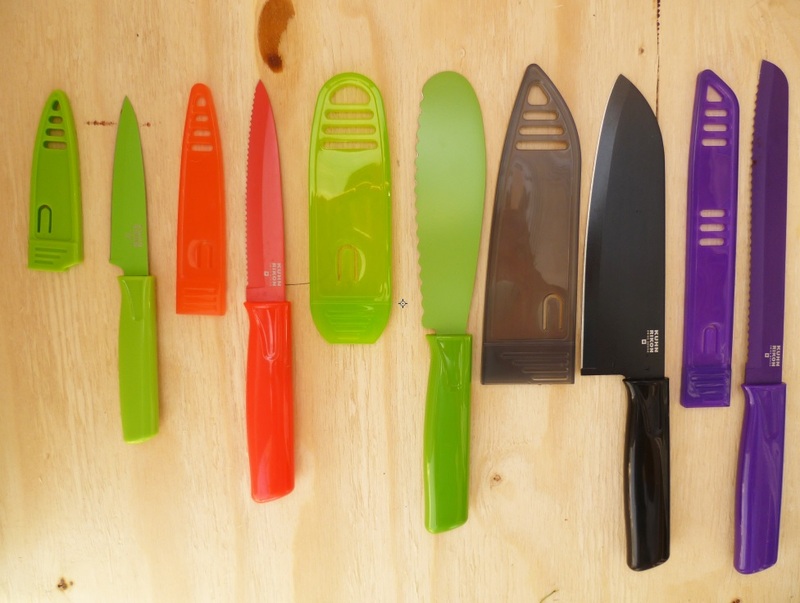 Kuhn Rikon have been very kind, they have offered to send one simplyfood reader a set of knives consisting of a Paring Knife, Serrated utility knife, Chef’s knife and Bread knife. This competition is open to UK residents only over the age of 18 only. Please read the rules below. A good sharp knife and a decent chopping board - I love chopping! I love my blender for making soups and smoothies! My favourite utensil has just died a death- a wooden handled, carbon steel knife that was 5" long (sharpened down over years from 8"). I reach for it several times a day and am always disappointed in it's loss. My Juicer. Great way to get your 5 - 10 a day. Some amazing recipes with some great twists to add some unusual flavours to hit yoru taste buds. My grater, as I use to grate cheese and also to grate veggies as I'm not good at cutting finely. A ladle, for slopping lovely soup into bowls! My garlic press. Used so much I usually need a new one each year. The chef's knife I use for everything. My veggie peeler... just love it! Without hesitation, I would choose my 'Kenwood CH180 Mini Chopper'. Best kitchen purchase I have ever made. I use it almost every day. A particular knife I use for almost everything. I am obsessed with my spiral cutter at the moment, perfect for turning courgettes into healthy spaghetti! The kettle. Couldn't live without it. My peeler - I've never been able to find another the same or half as good! My small Kitchen Devils knife. My ancient and nearly dead 50's melamine set of 3 lifters - use them for everything and they withstand heat and cold, microwave and whatever - it'll be the ravages of time that gets them! My hand electric hand whisk, it saves so much time and so easy to use and clean! My metal tongs. They were my mother's and have saved me from many burns as I can move almost anything with them. My mixer! - mixing up soup! My thermomix is great for making virtually everything ! I love my toastie machine! do they work , how do you sharpen them? My potato masher. My partner says cleaver. Ooh these would have to be displayed somewhere in my kitchen. How stylish! Microwave,how did we ever live without them? A lovely sharp knife that works well on everything. My sharp little knife that I use everyday. I have a knife that's half serrated knife, half palette knife - I use it all the time. I love my paring knife as I use it for nearly everything! My blender. I'm so lazy in the kitchen haha. a cast iron pan i have, old as the hills and heavy as anything but not a thing sticks to it. my kenwood chef mixer. i love it. My cheese mill that I recently bought from the Ideal Homes Show. I've got this cool little peeler/grater devise my aunty in New Zealand sent me. It's very handy. My sharp vegetable knife - so useful. My 30 year old straining spoon! My mandolin , love the thinness I get, love experimenting with making my own crisps. Potato masher. Quicker and easier than food processors and I think it makes nicer mash. My microwave - I couldn't live without it! garlic press it changed my life! My electronic potato peeler , I hate peeling them . The grater, its so versatile i love it! I love a pair of tongs! !